A newly-published Apple patent application (via AppleInsider) reveals Apple's interest in exploring the use of the iPod nano's clip as a charging and docking mechanism, a move that would eliminate the need for a dedicated docking port on the bottom edge of the device as found in the current design. By incorporating electrical contacts into the clip and using a dock adapter to provide compatibility with Apple's current docking stations, the clamping action of the iPod nano's clip could hold the device in position for charging purposes. In some embodiments, a portable user device may include a rechargeable battery, and a clip member that is electrically coupled to the rechargeable battery. The rechargeable battery may be charged by electrically coupling the clip member to a receiving receptacle. In some embodiments, the clip member may provide a clamping force which aids in maintaining contact between the receiving receptacle and the clip member. 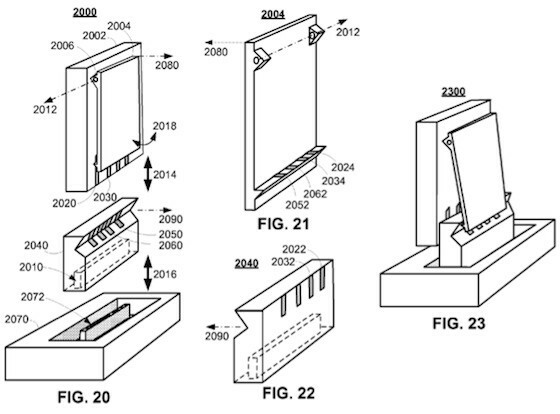 Apple's patent application also describes a number of other implementations for the clip-based charging mechanism, including the ability to clip directly onto a charging point on the bezel of another device. The newly-published patent, originally filed in January 2011, is not the first time Apple has proposed a means to increase the utility of the iPod nano's clip. A May 2010 application proposed integrating a piezoelectric speaker into the clip, while a prototype device has hinted at plans to equip the device with a rear camera that would project through a hole in the clip. A new rumor surfacing earlier this week claims, however, that Apple will be abandoning the current iPod nano design later this year in favor of an oblong design with a larger screen and a home button similar to that found on iOS devices. Apple is also rumored to be bringing a smaller dock connector to its iOS devices later this year, a feature that could make its way to the iPod nano as well given that the device currently uses the same dock connector design seen in iOS devices. Highly dangerous. Be sure to avoid this. Can we please, please have the "downvote" button back? Even if just to stop the spread of misinformation like this? This is no different than the Magsafe charger. Try plugging it in and pressing the notebook end to your palm and see if anything happens. Answer: nothing does. Can't they just sync/charge through the headphone jack like the shuffle? I always liked that solultion. Wow, this is actually really, really cool. Neat idea, clip on for charging. But come on, can't we get wireless charging please? I know it takes a bit longer/slower, but even as an option? Not only slower, but it takes up a lot more space inside. There's no room to spare when you're trying to remain small. Why is this dangerous? You don't have to worry about voltage until it nears 40V. This is no more dangerous than picking up a AAA battery with your bare hands. Yeah I really really miss the downvote button :(. Standard USB is 5V at about 200mA. This 1W wouldn't be too dangerous. The magsafe charger, when not driving a load, is safe, but when the connection is properly established with the computer, it can drive upwards of 45-60W. That could start a fire. If we had the down vote back, I would down vote you both. Puevlo's misinformation errors on being overly cautious. Your misinformation errors on getting someone hurt. IMO, I like only up voting. With both up and down, I think it turns into a popularity contest. On a typical bi-polar topic, something very interesting could be relegated to obscurity if nearly equal numbers of people vote opposite of one another. With only up, it turns into a positive indicator; like being vouched for. It still supports minority views, but weeds out the whack jobs. Interesting concept. However, Apple nice charging methods are always tampered by case manufacturers.